When the law is on your side, argue the law. And when you have neither, pound the lectern. cringe-inducing noise when you do. One of my favorite episodes of Frasier parodied the horrendously purple prose of the bestselling novel Bridges of Madison County . In "Slow Tango in South Seattle" Frasier discovers a chapter of his life has been stolen by a writer in whom he'd once confided over drinks at Cheers. Towards the end of the episode, we see Frasier sitting in his recliner reading the conclusion of the book. "Now, he was leaving, going, vanishing..." Unwilling to read the entire, florid passage, he skips ahead... three full page turns. He continues reading, "And so he was gone." That scene popped into my head on Friday as it slowly and horribly dawned on me that Luis Li might not stop talking for hours and that closing arguments would probably go into a fourth day. This has been a long trial. The ending has been endless. That closing argument was, in a sense, a fitting conclusion to the defense's case. As they have done throughout, Li buried the jury in a torrent of words. The argument was repetitive, circular, extraneous, tangential, internally contradictory, and delivered with a tone of juvenile petulance. Dear God, that was insufferable. It took me the better part of the weekend to unscramble my thought process. As has so often been the case with both Li and Do's cross-examinations, I was left with a monster headache the next day. I've realized that this is part and parcel of the siege mentality with which the defense has approached this trial. They have pelted the State's case with rubble for months in an attempt to wear down the prosecutors, the witnesses, the jury... even the judge. That trial by onslaught approach became glaringly apparent to me when I was watching Truc Do's eternal cross-examination of Dr. Dickson. The problem, though, was that she exposed her flank. In the end, she showed the gaping holes in her own argument because she talked too much for too long. The savvy, knowledgeable Dickson debated her points quite ably. Li made a similar strategic error on Friday. His filibuster backfired. If he'd kept it short enough that Sheila Polk still had time for her rebuttal, she would have been presenting her final remarks to a jury too mentally exhausted to make heads or tails of anything they'd heard that day. Tomorrow she will go before a jury that is rested, refreshed, and capable again of higher brain function. "You know, everything is not an anecdote. You have to discriminate. You choose things that are funny or mildly amusing or interesting. You're a miracle! Your stories have NONE of that. They're not even amusing ACCIDENTALLY!... It's like going on a date with a Chatty Cathy doll. I expect you to have a little string on your chest, you know, that I pull out and have to snap back. Except I wouldn't pull it out and snap it back. YOU would! Agh! Agh! Agh! Agh! And by the way, you know, when you're telling these little stories? Here's a good idea - have a POINT. It makes it SO much more interesting for the listener!" If the jury fails to convict, it won't be because of the tactical genius of Ray's defense team. But they've done a couple of things well. They've fought successfully to have some of the most damning background material excluded. And they've argued at least reasonably well that the participants had free will -- that they chose to be there and could have chosen to leave. Jury consultant Dr. Dennis Elias explains the central conflict in the interview embedded above. The decision may boil down to whether the jury believes the participants in the case were acting on their own free will as the defense argued, or were conditioned to ignore they and others were in distress. 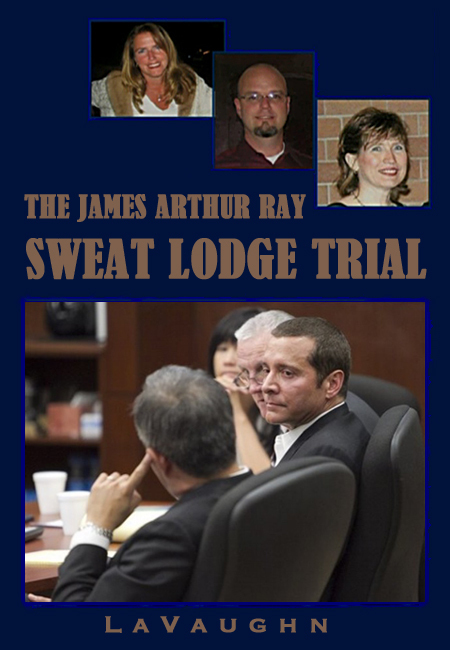 For those of us familiar with the groundbreaking research of Dr. Stanley Milgram, it's very easy to understand why so many people in that sweat lodge were submissive to James Ray: self-described "master of the lodge." Put simply, most people defer to those they perceive as authority figures. It's an ugly, hard to face truth about human nature. I know when I saw the documentary "Obedience" as a college kid, I wanted to believe that I would have stopped administering shocks to the "learners" even earlier than the most resistant participants, all of whom did so longer than they were comfortable with. But I have no way of knowing that. I know that the film served as a warning to me and has certainly informed my rebellious nature. Milgram's findings contradicted the expectations of his Yale colleagues and students, all of whom predicted a very tiny percentage of subjects would administer high voltage shocks. In his first studies, 65% progressed to the full 450-volts, despite their expressed discomfort in doing so. I bring up that point because it so well underscores the disparity between perception and reality. It's so much easier to think that the people who would violate their own instincts and ethics, just because someone in a lab coat tells them to, represent a kind of freakish minority. Similarly, Luis Li considered the witnesses who didn't conform to his ideas of free will "a little odd." A large body of psychological research says otherwise but we have no way of knowing how familiar the jury is with that data. And the State was not able to present their cult expert Rick Ross. It seems to me that the more salient points are that the people in that sweat lodge were exhausted, undernourished -- having only just broken a 36 hour fast -- and, most importantly, superheated into varying degrees of delirium. By the time some of them began to realize that Ray's promise that they wouldn't die no matter how they felt might not be true, they lacked the wherewithal to get out. They were slipping into unconsciousness like Linda Andresano or staggering into the heated rocks like Lou Caci. It's also impossible to freely choose something when you're under-informed -- or misinformed -- about what you're walking into. It's funny. In retrospect, I think that waiver that the defense had made such an issue of throughout the trial is working for the prosecution. As Sheila Polk pointed out to the jury in her closing argument, it gives the lie to Ray's lack of awareness that people cold die. But it was only devised to protect JRI; not the participants. It only says there may be a sweat lodge and it compares it to a sauna. No sauna is that hot or that long. And there is no health questionnaire. Most importantly, at no point, not in the waiver, nor in Ray's speeches, does he tell people he'll be inducing those "altered states" by inducing heatstroke. I really doubt people would have gone along with that if they'd known. There's a difference between consent and informed consent. One of the most interesting things about these final days of trial has been the perspective offered by the new camera angles. Trial watchers have finally gotten a good look at what appears to be a heavily sedated James Ray. The once dynamic, charismatic public speaker and television personality is almost completely bereft of expression... or natural movement. He looks like he's auditioning for the role of the Hymie the robot in a remake of Get Smart . It's just so bizarre. What kept popping into my head was a video the Salty Droid did a year or so ago juxtaposing Ray's antics with the Dresden Dolls's "Coin Operated Boy." So tomorrow should at last bring the end of the end of this case. Sheila Polk will present her rebuttal to Luis Li's stream of consciousness rant. She will undoubtedly be brilliant. And then it will finally go to the jury... That's assuming defense attorney's don't start screaming about reversible error and making more mistrial motions. I wouldn't discount that possibility. Here's hoping CNN let's us see it, whatever happens. will Sheila Polk's response to Li's "mess"-age be available. Unfortunately I missed it and really wanted to see it. the focus on free will seems wrong to me. mans tendency to follow the leader is the culprit here. and there is ample historic evidence of it. from jesus to the devil, most everybody wants something to believe in and is willing to contort their lives accordingly in order to conform to every kind of belief system imaginable, and plenty that are unimaginable. almost all peoples attempt to teach their young men, and now, women, it is perfectly OK to dress up in a uniform and go kill "outsiders". and the most important tenant in that universally accepted dance is, "follow orders." @The Sisters, I've posted some of the text of Polk's rebuttal here with commentary. The Salty Droid has created a video with some of the highlights. @flightseeker, There is no question that human nature is submissive. This country was founded on this revolutionary idea that power could flow upwards but our natural tendency is to keep handing our power over to other people. We, as Americans, have a very idealized notion that we are "free" but the truth is that we still tend towards submissiveness to authority, as Milgram's research showed. There are cultural variations but they aren't as great as we think they are. For whatever reason, we seem to be hardwired that way. The reasons are something I contemplate a great deal. From a woo-woo perspective -- and I spend a lot of time in the woo -- I could point to Zecharia Sitchin's theories that we are descended from a slave race. More resonant for me are the Gnostic teachings on the archons (leaders) so brilliantly illustrated in The Matrix trilogy. But it could also be a simple as we evolved this way because it was the difference between surviving or not. Functioning as a unit, under good leadership, has always been fundamental to group safety. Yes, there is a problem with being a "Good German." At the same time, when people are in combat situations, following orders is the difference between life and death. It's not simple. We have to function both as individuals and as part of group. It's a balancing act, and neither total submissiveness nor total anomie are the answer. Case in point: My husband and I were watching the Luis Li video that Salty put together and laughing our asses off. My husband said, I think perhaps he read Emerson's "Self-Reliance" and took it a bit too far. At what point does a strong sense of self become narcissism? Difficult questions all.